One hundred different familiars/pets that can accompany you on your travels! A young dragon that was permanently shrunk by cursed magic, and is unable to speak in any form. Will take hundreds of years to mature and is learning magic by being a familiar and observing spellcasters so as to learn how to undo his curse. A horrible looking humanoid homunculus with sharpened teeth that must eat human flesh as food, and eats nothing else. Will pursue food on his own if not fed, but is otherwise perfectly docile. A baby peryton, that loves to hunt small animals and kill them for food and fun. Hates elves, and loves to make it known. It’s shadow is that of a tiny humanoid flapping its arms as it flys. A normal familiar creature, but with a pouch on its belly, where it keeps various trinkets and valuables. Obsessively steals trinkets and valuables if left unattended. A tumor that has grown on the spellcaster, has a tiny mouth and grows sparse hair, may have an eye or two. It posses its own brain and has an excellent memory, but little intelligence. can recite spells perfectly but lacks the intellect to carry a conversation or ask any questions. A tiny construct that chirps and whirrs as it flys around. Possesses a small glass orb of magic that may be used for scrying. Prefers spellcasters with missing arms or hands, so it can change shape and take the form of the casters appendage for as long as it desires to. A small fire elemental vanished from the plane of fire shaped like a black cat, leaves black ashen tracks everywhere it goes. It can be commanded to summon its tiny fire powers to explode damaging everything around it, but like most cats, is temperamental and difficult to control or command. A clockwork badger. Dig speed 30 feet, will straight up ruin the day of anything it doesn’t like. A particularly spiteful faery that’s run away from home and latched onto you because it likes the color of your eyes. Occasionally changes your hair color in the middle of the night and refuses to be told what to cast or when. An egg, with legs. Nobody’s been able to crack the shell yet, but it’s convinced you’re its mother, and will probably attempt to eat the rest of the party when it comes out of its shell. A tiny alligator. Like ridiculously tiny, three inches long at most. The only way you can tell it apart from a newt is it occasionally latches onto a finger and draws blood. But it’s very good at sneaking into and out of places. Micro-dragon. If it curls up, it fits into the palm of your hand. You found it in your gold pouch one day clutching a single gold piece, and it refuses to let go. Can produce a small flame as with Prestidigitation. A Fuster Cluck. A rooster with comically large wattle and tailfeathers. The cosmic rules governing reality tend to bend near this strange creature, resulting in things going terribly, horribly, implausibly wrong for a creature nearby. Enchanted, sentient spectacles that has way better passive perception than you do. Whispers in your ear when it’s seen something you haven’t. Occasionally likes to play pranks by insisting there are monsters nearby where there are none. A Personal Assistant Imp, four inches tall, who lives in a cage. He tells time, he takes memos, he reminds you of important dates! He usually does a poor job of it. Yes, I’ve just started reading Terry Pratchett, why do you ask? A succubus the size of a halfling. A small variant of a winged serpent. It has a tiny lightning breath, and can fly unhindered in storm clouds. An animated sapling. It can blend in perfectly with trees as long as it closes its eyes and mouth, stands still and is on a spot that would normally grow such a tree. A platypus. It has a poisonous claw attack. A sea otter. It can move freely (35 feet) on both land and water surfaces. A giant slug. It has a movement of 10 feet. It regenerates hit points at an extremely fast rate. It can be placed on any kind of surface for an hour (except for salt) and gain resistance to attacks of that element by absorbing some of it. It also has a ranged acid attack, that can corrode metal slowly. A small, burrowing, armored worm. It can move in dirt at movespeed of 25 feet. Above ground it can move at 35 feet. It has tremor sense. A small feline creature with rainbow colored insect-like wings (flyspeed of 30 feet). It can cast color spray once a day. It is very energetic and enjoys hunting for small fey creatures like pixies, though it is easily outsmarted by them. A ferret with impossible colorings and patterns in its fur. A goldfish. Yes, the fishbowl is required. If the goldfish is happy you find it easier to hold your breath. You have advantage on con checks for doing so. A chihuahua with a lions soul trapped in its body. A penguin. It may or may not be hiding an egg between its legs. The egg may or may not be a penguin. A featherless hawk. It can’t fly, but it sure is funny to look at. A chinchilla that when given an opportunity for a dust bath emanates an aura causing intense positive emotions. A small fairy that can tell you where the nearest pub is when you enter a new city, based on the scent of ale. A tiny bard that lives in a music box, except it will only sing a song about wanting the box to be closed again. A lamia, but with the lower half of a mouse. A tiny treant in a small clay flower pot. A magical flying origami swan. It can detect the aignment of living things, and reacts accordingly. A tiny sandstone golem, that carries a tiny umbrella, which it uses to glide around. It has enough strenght to jump on a shoulder. A yellow electric rat. It has a weak lightning attack, and it’s tears can cure petrification. A sentient knife tied to a long and thin string. While it cannot fly, it can propel itself in any direction (kinda like a jellyfish), and will promptly attack anyone who menaces it’s master. A mummified cat, that seems indifferent to anything that happens around it. Does not need to sleep, eat or drink, even though it does all of that frequently. Also, it is an unlimited source of dusty toilet paper. A small dog, like a chihuahua or a pug. It can speak, but ONLY one-syllable words. An albino raven that occasionally speaks and more rarely has visions of the future. A silver sphere the size of a juggling ball. It can roll around and jump short distances and can detect the presence and intent of magic and acts accordingly. A tiny grey ooze that can psychically communicate with any creature it touches, it can only communicate general ideas and not specific words this way. An animated shrunken head that can fluently speak common. An enchanted octopus that can survive on land indefinitely and can change it’s color and texture on land as well. A Velociraptor wearing a top hat and monocle that generally scoffs at fighting. A Will-o-Wisp that lures strangers to owner of the familiar without warning the owner. A Cloud Otter; an otter with white or gray fur that can swim through the air. An Animated Object, for example a large wooden spoon, that complains whenever it is not be used to fulfill it’s purpose. A vulture that vomits ale as a defense mechanism. A lump of enchanted patchwork flesh that turns into any of the monsters on this list with their associated ability, for 12 hours (d100 for what it turns into). A baby. For everyone else, this IS a baby; to the owner, it is a living embodiment of their own magical will. It cannot be killed by mundane or magical means, and for all intents and purposes is indestructible; but if the spellcaster is damaged, the baby is damaged (which also means, if the spellcaster dies, the baby dies). Think ‘Portrait of Dorian Gray’, kinda. Additional: a psychic link between caster and baby reveals the baby is himself–and thus, can converse with the baby/himself psychically or verbally (but the baby cannot speak, itself). It is able to move–‘crawl’–up to a few meters away, and can share what it sees with the caster. Basically, it can do baby things, and obeys commands that the caster gives it, to the physical limit of a baby. Note-slash-edit: using the baby as an object (re: ‘I’ll just go around and beat everyone with it then!’) saps the spellcaster of any goodness inside them–the more evil they become, the more blackened, bruised, and ugly the baby gets. A lion turtle (yeah, THAT lion turtle. Not super huge, as it ain’t too old yet–think ‘average tortoise’-sized. Which, I also suppose, means it’s still in it’s infancy?). 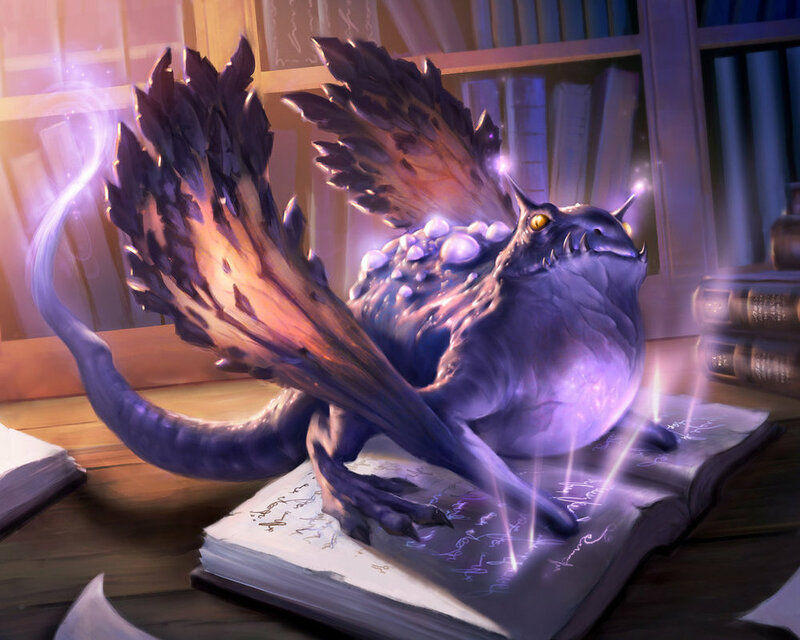 Can either: hold extra spell slots for the caster, or turn one spell per day into a spell level higher (turtles’ choice–which, really, is GM’s choice), cast a random spell as needed, or finally, lets it’s owner reroll a saving throw (boost of luck). A tiny metal (or clockwork) danger noodle–er, snake–that only the spellcaster knows is animate. Can either be the size of a ring, a necklace, or a belt (re: growth/shrink). A ventriloquist dog–upon receiving, spellcaster goes permanently mute (until dog is no longer their familiar). Dog speaks for them in a perfect accent of your choice (although German just sounds inherently funnier). An animate shillelagh, imbued with the spirit of a dog. The top half/thicker half is carved to look like the face of either an English bulldog or a corgi (dealer’s choice). An old silk hat. Place on a mound of matter, to become a golem of said matter. Once belonged to a wizard. Mushroom Jesus. A Small-sized anthropomorphized fungi that you can eat pieces of that will save you… from starvation. Regenerates each day. When not being eaten, is rather enjoyable to be around. Immune to poisons. A squirrel with naturally occurring plates of bioarmor (re: pangolin). A thousand year old vampire alligator. Eats ideas, concepts, words; libraries are grocery stores to him, whereas taverns have the highest-quality foods. A green fox that laughs like a small child. Provokes a chance of madness in those who tell it bad jokes. The spirit of a town drunk. The drunk is not dead; his spirit just leaves his body whenever he becomes ‘blackout drunk’. Useful as much as you think a spirit would be. Bees. You wear their ‘queen’ in a golden amber oval around your neck; it cannot be stolen, as it has adhered to your flesh (it just LOOKS like it’s a necklace). Eating/drinking your hive’s honey imbues more magical potency. Making/drinking mead doubles it (but, it’s mead, so it’ll getcha drunk). The honey potency only applies to you, but the mead can be sold and applied to anyone–but again, it’s mead, so it’ll get them drunk. A magical, sentient brick that can communicate with you telepathically. An ancient tortoise with lichens growing on its shell. Firebat – engulfs in flames on demand, lighting an area of 20ft of bright light and 10ft of dim light. Does 1 fire damage to anything it touches but can not spread for. Can give it one simple command as a bonus action. A 10 inch tall brass Golem capable of following simple instructions; it makes a happy whistling sound when it completes a task and often watches its master with great curiosity and will try to mimic them. A small pink blob like humanoid (Speed 20ft). Has the same ability of a bottomless bag, with an additional ability to act like a weak vacuum. It has low intelligence, and can only make baby noises. An animated feather that writes whatever the owner wishes in anyones’ handwriting if treated nicely and is provided ink. A small palm sized cube slime. Can be placed in any room and will relay what has been spoken when the owner holds it telepathically. It must be fed small rodents and insects daily, or it will dissolve. A very long wooden snake that generally wraps around the users neck like a scarf. When commanded it can straighten out into a monk staff that deals 1d8 dmg. It will die if caught on fire. A pocket sized frog that when placed on the ground grows to the size of a war horse. It is a mount that can jump vertically equivalently to the PC’s speed, and moves at double the PC’s speed. It can shrink back down when commanded. If it lands on an enemy smaller then it, it deals 1d10 dmg. A parasite that has lodged itself into the PC’s brain. It can communicate to the user, however the user must verbally talk to communicate back. It is able to tell the alignment of whoever the user is talking to. An undead skeleton hand that is placed upon the users hand. It gives a bonus of +2 to dex checks as it sometimes takes control of the PC’s hand to help out. A palm sized spider that can mend any fabric based thing that it is told to by its owner. A finger sized eldritch deity that gives +2 necrotic dmg to rthe PC’s attacks, as well as a 10% chance to cause madness to the target of a PC’s spell for 1d4 turns. A pact must be made with it to help it seize power of a realm. A mimic that stays as the users backpack. When thrown at an enemy it attempts to devour it against a strength check. If it fails then it just does 1d4 damage and ,ust be retrieved by the PC. An invisible spirit that can’t talk. It has the mage hand spell as an ability. A large parrot that is able to translate the more common languages, but yells the translation directly into the spellcaster’s Ear. A small cat-sized Owlbear that has a natural aptitude for finding things (+1 on investigation rolls). Like most Owlbears it has a large appetite and is almost constantly hungry. If it’s left unfed for too long it tends to be temperamental (doesn’t help in investigations) and, for some reason, makes attempts to eat the shoes of the spellcaster. A Kua-toa child. Fiercely loyal to the caster and views them as a divine figure. They can manifest minor clerical powers through their devotion alone. A boggle that started off as the character’s childhood imaginary friend, then slowly grew in power. The boggle can become very resentful if the character seems to be making friends with someone new. A sentient clam that happily babbles in an unknown language, assumedly Clam. It sings amazingly despite its incomprehensible language, and has advantage on all performance checks involving singing. A patient spellcaster may be able to pick up the language if they are persistent. A will-o’-wisp that has taken an interest in the spellcaster and follows them of its own free will. It is mischevious and a tad cruel by nature, and occasionally floats off for hours at a time before returning. It often zaps party members at inoppurtune times, and lingers after fights to consume the souls of the fallen. That aside, it is still supportive of the caster and readily provides backup as a distraction during truly dire combat. It occasionally acts as a guide when the spellcaster is lost, though it will sometimes play tricks on the caster in the same way. When the spellcaster is casting a spell, the will-o’-wisp circles the caster at rapid speeds, and will add an additional 2d8 of lightning damage to it if the spell also does lighting damage. A sentient transparent orb filled with smoke, that also doubles as a spellcasting focus for the caster. It communicates through movement of the smoke, with peaceful drifting indicating contentment and violent swirling indicating agitation. After gaining trust in the spellcaster over a long period of time, the spellcaster will begin to see pictures in the smoke that only they can see, which hint at the history of the orb. An oddly colored caterpillar the size of a human arm. It enjoys sunbathing on the caster’s head and eating the caster’s clothing. The caterpillar will eventually enter an unnaturally hard cocoon in which it will undergo metamorphosis into an enormous butterfly. The butterfly will continue to follow the spellcaster if they propery cared for it before its metamorphosis, and can cast Giant Insects without concentration as a spell-like ability once per day. A small, seemingly conscious cloud of blueish smoke. Can distract and hinder enemies by hovering by their mouth and nostrils, but otherwise doesn’t do much other than following it’s master. A chameleon that can’t quite manage to match whatever color it is hiding against but can occasionally display distant images or things it has seen. A rock. It doesn’t eat much but always seems to be some place different when viewers look away and then back. Flying fox-voracious fruit eaters, it lets your gather 2x as much food foraging. Appears to onlookers as a 5ft tall bat and can be used for intimidation. A snooty noble who was polymorphed into a schnauzer. He will often complain about the conditions that he and his master must endure, but can be quite charismatic. A tiny Da Vinci style helicopter construct that seeks out great inventors and artists. A potoo bird that can be completely disguised if it’s standing still on a tree, with a branch at least 1 feet wide. A turtlehorse is a creature that is, obviously, a cross between a turtle and a horse. Its the size of your every day turtle with a main of brown hair, a long snout and hooves. It only has one power. If you cut off one of its legs a horse sized version of the familiar appears to be your steed. But if you cut off all 4 legs the turtlehorse dies. A living wristwatch/amulet/medallion that can sprout legs and waddle off.